Rebecca Carl leads university events, conferences and ceremonies for Indiana University. She and her team develop and manage over 500 events and conferences annually. She also has extensive experience in strategic planning and communications, marketing, branding, market research, business development, and management. In addition to her appointment with the Office of Engagement, Carl holds an associate faculty position in the School of Public Health at the university. Carl is the former chief marketing and community relations officer for Clarian Health Partners. At Clarian, she provided corporate oversight in the marketing and corporate communications areas, as well as health promotions, events, and public and community relations. Prior to joining Clarian (now IU Health), she was director and then vice president of marketing and communications at Arnett Health System in Lafayette. 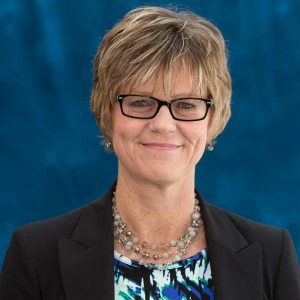 She was also associate director of South Bend’s Madison Center and Hospital, which is the largest provider of behavioral health services in Indiana, and director of business development and marketing at the Center for Behavioral Health in Bloomington. A graduate of Indiana State University, Carl also holds an M.B.A. from Butler University. Carl serves on the board of the Girl Scouts of Central Indiana, an organization that serves over 30,000 girls in 45 counties throughout Indiana. She has formerly served on the boards of the Coalition for Homelessness Intervention and Prevention (CHIP) and the American Heart Association (Indianapolis Chapter). She and her team have won a number of awards for outstanding marketing campaigns and products.